In a large bowl mix the condensed milk, butter, corn syrup, salt and vanilla. Slowly add in the confectioners sugar until mixture holds together (you may not need all the sugar, use more or less depending on the consistency of the mixture), you may find this easier to do with your hands. Remove 1/4 of the mixture and place into a small bowl. Color this mixture with a little yellow food coloring. Form into 10 to 15 small balls, set aside. With remaining white mixture, form into 10 to 15 balls. Flatten these balls and wrap them around the yellow balls to form an egg shape. Place on wax lined tray and cover with plastic wrap. Refrigerate for 4 hours. Melt the chocolate over a double boiler. 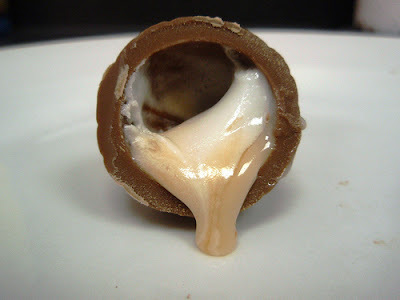 Gently dip the cool eggs into the chocolate and allow the excess to drip off. Place onto wax paper to cool. omg you're killing me over here!! !